We will depart from downtown Portland and head east along the Columbia River to Troutdale, known as the Gateway to the Gorge. 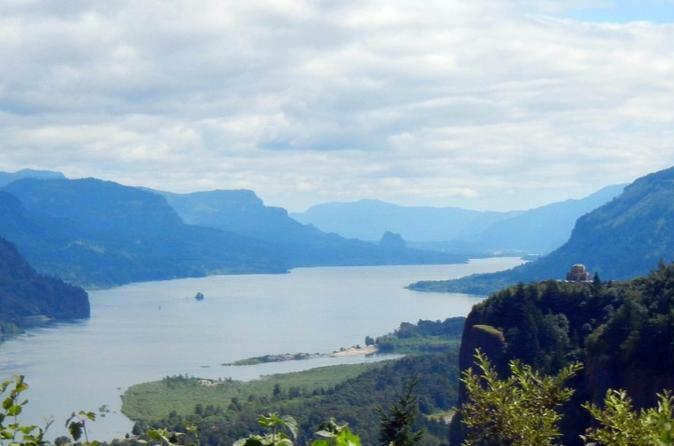 From here, we will embark upon sweeping views of the Columbia River Gorge and Crown Point. A land mass that resulted from an ancient lava flow around 14 to 17 million years ago, this point holds the location of the Vista House. We’ll have ample opportunity to explore waterfalls in the area, including famed Multnomah Falls and historic lodge. Leaving the Historic Columbia River Highway, we’ll make our way deeper into the gorge and toward our next stop at the Bonneville Lock and Dam, a run-of-the-river dam that spans the Columbia River. Once at the fish hatchery, which proudly boasts a title as the largest in Oregon, we will have the opportunity to take a short walking tour to the sturgeon viewing center. The viewing center is home to Herman the sturgeon, our local, celebrity fish. Herman is over 70 years old, 10-feet long, and 450 pounds! Following lunch, we will out again and meet back up with the Columbia River Historic Highway and wind our way toward the iconic Rowena Crest Plateau and Viewpoint. The overlook offers a panoramic view of the delicate, horseshoe curve along the historic highway. As one of the most photographed sections of road in Oregon, we’ll have a bird’s-eye-view of this unique landscape. After exploring the area and overlook, we’ll travel along the horseshoe ourselves to continue our journey. From here, we will cross over the Columbia River into Washington. Traveling along the gorge’s northern scenic route to at the Bridge of the Gods, named after a natural stone bridge that has since vanished, we’ll have a moment to take in the scenery. We’ll then make our way across the Bridge of the Gods, back over to Oregon and onward to Portland.